TB Parts 108cc Stroker Crank with Race Head, Bore and 24mm Carb Kit. 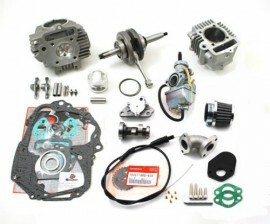 This is a complete kit to upgrade the stock engine to a powerful 108cc engine. - Race Head – Larger valves (25/22mm) and better flow for increased performance. Also has bigger cooling fins. Includes all necessary parts and comes assembled! -Lightweight aluminum cylinder with steel sleeve, cast in mounts for skid plates, and larger cooling fins. For the Aussie Z50A and Z50J1 68-78 models, CT70 69-79 3 speed models. Crank spigot measures 56mm from the cam drive sprocket to the end of the threads, please check this measurement against your crank to ensure that it is suitable for your engine. Some model bikes may need slight adjustments for carb to fuel tank clearance.